So two years ago, my car got stuck in a snowdrift. In my defense (and that of my car), more than half the city got stuck that day. Ironically, by 1:00 pm it had gotten so warm out that ALL the snow had melted. If I'd known, I would have walked home and come back 3 hours later to drive the car away. My car is equipped with the best snow tires money can buy, and had 100 lbs of sand in the rear, but they were no match for this snow. It was heavy, wet, and deep. The RWD just could not do it. Now, I hate being stuck. Possibly more than some people, it is a recurring nightmare for me. I used to own an AWD sports sedan that would not get stuck, period. In bad weather, I could literally wait for a couple of 4x4s to lay ruts in the medians and follow right along. I loved that about that car, and the RWD of my current vehicle is the only thing I dislike about it. After this episode, I ran across the Peerless Auto-Trac tire chains in a brochure. They looked cool - practical and gadgety at the same time! Unlike my old AWD, clearance was not an issue on the car, and for around $100 they seemed like an OK value. Who could resist? Of course, there would be no possibility of returns, so I triple-checked the fitment and model numbers. Several weeks later, I finally had them. And they did not fit. 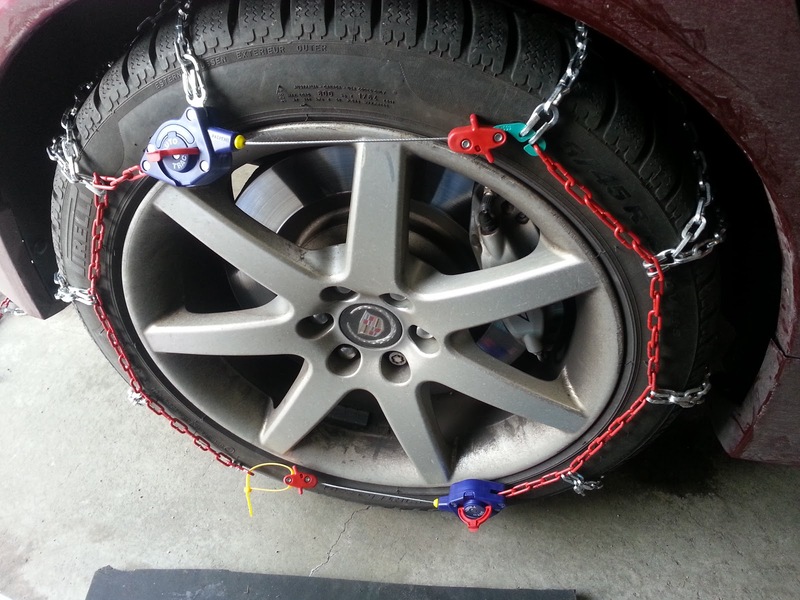 My tire size is 245/45R18, and I bought model 0155305 chains. According to Peerless, these chains fit my car, but they did not. I added the zip tie for clarity, and to allow me to take the photos hands-free. Obviously I could not drive like this. Trust me when I say that I tried my damndest to get the chains on for almost an hour, and this was in a dry and relatively warm garage. This story is not a bad review, however. I sent the photos above to Peerless via their e-mail customer service address. I got a reply the same day saying someone would follow up. I had my doubts, but on the weekend (!) I got a call from a fellow who said he had just gotten back into the office and saw the email. He said there was obviously an fitment issue and offered to send me a bigger set of chains at no charge. I still expected I was screwed. I explained that I was in Canada, and that UPS Ground would charge me rapacious brokerage fees on the shipment. I was very surprised when he quite cheerfully and without hesitation changed the shipping to UPS 2-day Air so I would not get burned. 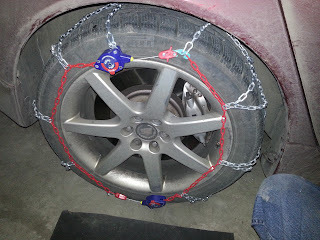 A few days later, I had another set of chains - model 0155505 - that did fit the car quite nicely. (They also fit my wife's SUV, which is a nice bonus.) The carrying case had some kind of plastic partition or liner it in that disintegrated in shipment, but the chains were brand new. So I have to say that the service from Peerless has been quite exemplary. There are not too many companies who would help so much. As for the chains themselves, they are what they say they are. They are obviously not heavy-duty, but will probably do you more than nicely in a pinch - say, when the CAA/AMA queue for a tow is 4+ hours long. You will want to test-fit them ahead of time. Not only to make sure they fit (!) but to get the hang of it. It is really very simple once you see how to go about it. The crafty - but plastic - tensioners really do very little work. Their only function is to snug the chains to the sidewall of the tire, and they bear virtually no load. 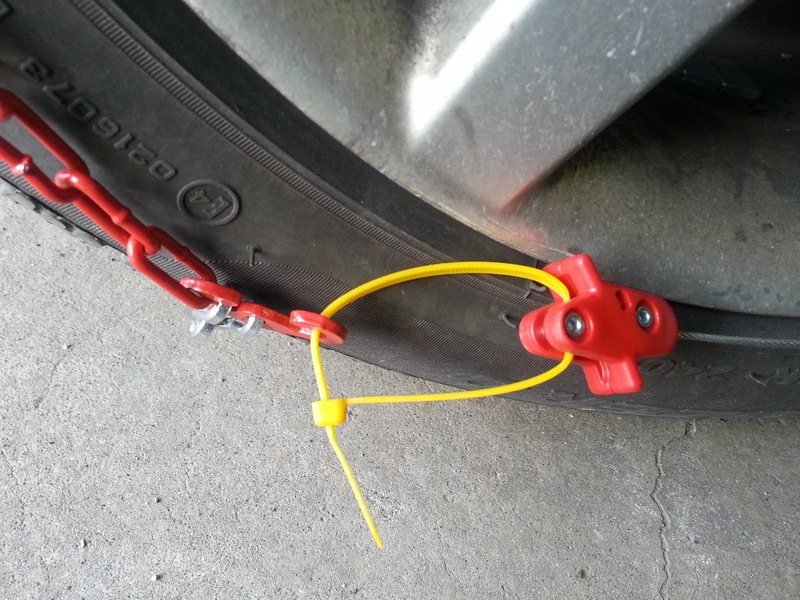 In fact, the side chains are relatively lightweight - not that the tread chains are massive by any stretch, but the red chains shown above do not take much stress at all. One might be forgiven for unconsciously expecting the chains to come in a left-side and right-side version. They do not (a little thought will tell you why). As such, when you mount the chains, the RED lead always starts off positioned for your RIGHT hand. Once you try it you will understand what that means. I imagine taking these off after use could be a pill, because you will have to unhook them at the back without being able to see the connection points. It's easy if you mount and dismount them without driving, because the rear-side cable latch point is at the top where you put it. After driving it will be in a random orientation, and it may take a bit of fiddling to get it unlatched. No big deal, so long as they get you out of the snowbank in the first place. They do come with a plastic installation guide that is supposedly intended to double as a mat to keep your knees dry. You might want to put some disposable gloves in the carrying case, though - things are likely to be mucky and wet when you have to put these guys on. The clearance requirements appear to be very small. The rear side of the tire only mounts a smooth cable, and the chains on the treads are very low profile. Unless you've slammed your ride, they will probably fit most any car, and almost certainly any SUV or truck. Mounting them with lower rides can be a little bit harder just because it's harder to get your hands between the fender and tire. They're unlikely to damage rims, but if that is your worry maybe you should not be driving your ride in the snow in the first place. I have not had to use these in anger yet but they are compact and do not take up much space in any trunk. For me, I will be happy in this investment if I use them or not. Just double-check with Peerless for fitment before buying. I imagine there could be other fitment errors in their catalog. Update! : I had occasion to use the chains today. The bad news is that the snow has been pretty bad and the plows can't keep up, so most residential roads have not been cleared. So I got stuck on an unplowed road going up a hill. I was not the only one. The good news is that the Auto-Trac chains went on fairly quickly and got me unstuck, and up the hill, in fairly short order. They also got me through the return journey, past the other folk who had gotten stuck going the other way. Getting them off was about as difficult as putting them on - not easier, but not harder either. The problem is finding the connection in the rear cable. Of course, being at the rear of the tire, finding that spot can be a little awkward. Be prepared to roll the car a foot or two, if necessary, to bring the connection to the top of the tire. I did notice some bumping in the wheelwells with the chains on. I looked once and one chain had gotten misaligned, and I was driving on the tensioner. The 2nd and 3rd times I looked I didn't see anything wrong, but the thumping persisted. I took the chains off as soon as I could because of this. So they work pretty much as advertised. On time was about 15 minutes, off time was about ten (maybe), and they did get me up a previously impassable road. They're inconvenient, to be sure, but between a six-hour wait for a tow truck and a half-hour work, I'm pretty happy with the option. - When test fitting, take into account any ballast you intend to carry. Fitting with an empty trunk will not be the same as when you have your five sandbags in there for winter. - If you can, reverse out of wherever you are stuck. Find a relatively clear/flat spot to put the chains on so you're not swimming in snow. - Drive downhill if you have to - twenty feet away from your destination is not going to kill you at this point. - Unfold the instructions sheet and put it in your open trunk for reference. It won't blow away there. - Read the instructions. You put them on once a year, so every time is the first time. 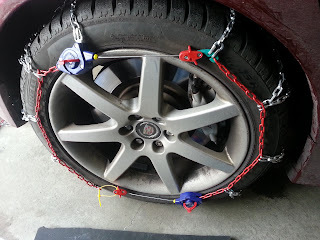 - After mounting, back up or go downhill first to get your tires on the chains. Then start moving forward/upward. - Check shortly after mounting to ensure the chains are on correctly and you're driving on the links, not the cable or tensioners. - Be prepared to move the car a bit to bring the rear cable connection to a place where you can reach it, to unhook the cable. Thanks. It is nice to know that it is not just me that experiences the noise. Your pics look exactly like mine did - it took a lot of adjusting and a layer of snow on the ground before I got them to fit; I would bet that if you had put a few revolutions on the tires with the zip ties on to even out the tension you would have been able to get them to fit. If I can't get them fitted properly in summer, in a dry garage, I am definitely not going to want to struggle with them in the cold, wet snow. Also, the replacement chains fit fine on the first try. No comparison.